Soak up some poolside bliss, with this luxury Central Lake duplex! 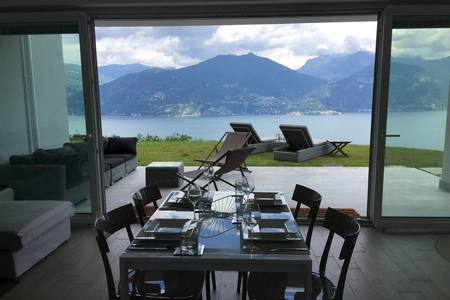 Boasting breathtaking lake views and flexible sleeping arrangements to suit families and groups of 4-5, this modern hillside duplex offers an exclusive holiday setting, and is just a short drive away from the picturesque lakeside appeal of Menaggio. 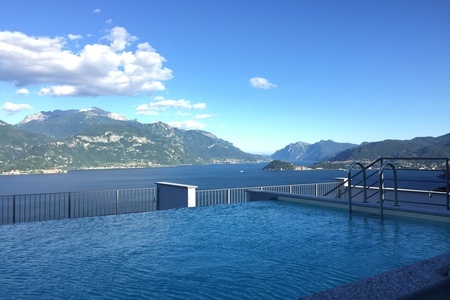 With sweeping panoramic views of the famous Central Lake and Bellagio peninsular to take in, the ‘wow factor’ backdrop promises the perfect setting from which families and friends can take in the very best of Lake Como. 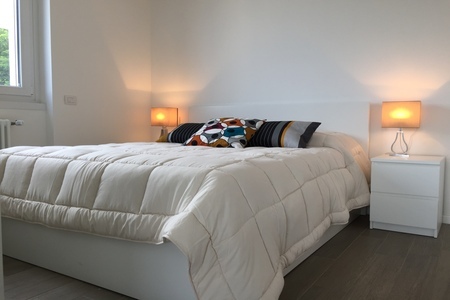 Inside, the contemporary duplex is fully-equipped to offer carefree stays; with free WIFI and air-conditioning on hand to complement the beautifully styled living space and sleeping accommodation. The restful open plan living area with flat screen SAT TV paints an inviting scene in which guests can enjoy guilt-free leisure and pleasure moments together. 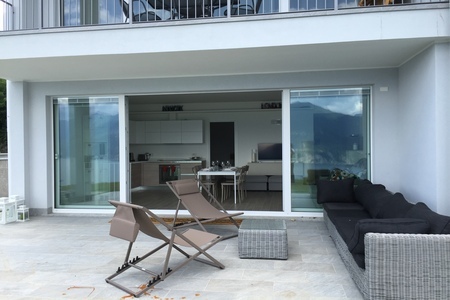 Ideally-suited for wining and dining a holiday away too, the floor-to-ceiling glazing here also enables guests to take in direct lake views from both the sitting and dining areas (which can comfortably sit 5-6). With the fully-fitted contemporary kitchen perfect for rustling up a tasty snack to a full-blown dinner party, guests can easily play host within this lovely home-away-from-home. All the must-have appliances feature, including an oven, induction hob, microwave, coffee machine, kettle, toaster and dishwasher. For those looking to celebrate a special occasion, a private chef can also be hired upon request too! (For more information please contact: entertainment@happyholidayhomes.net). Within the chic carefree flow of the apartment, two spacious double bedrooms enable couples and groups to easily enjoy a good night’s sleep. 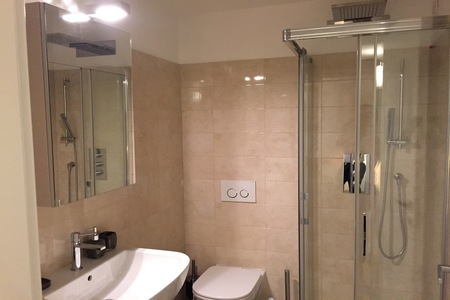 The master bedroom also offers a luxury en suite shower. Both benefit from a wardrobe too, whilst a single sofa bed to the living area offers added flexibility to accommodate a 5th guest if needed. Upon request a baby cot (EU 20) and adult single camp bed can also be hired (EU 85). Oozing the same tempting spa-style ambience as the master en-suite, the family bathroom is fitted with a bath tub and separate shower cubicle; perfect for enjoying a reviving morning shower or a tranquil moment in the tub. Perfectly complementing the beautiful open plan living and dining space, guests can enjoy the captivating hillside surroundings from the covered outdoor lake view terrace. Furnished with a sitting area with deck chairs and a sunny lake view lawn with alfresco BBQ dining area, the scene is set for carefree daytime and evening enjoyment. 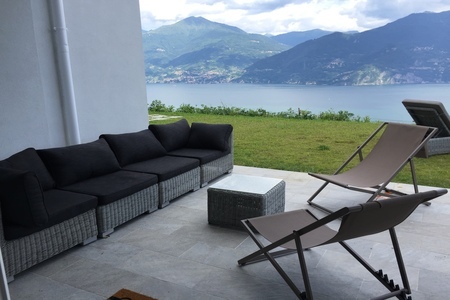 The large sunny private garden truly offers a delightful setting in which to relax on the chic sun loungers and take in the breathtaking views of the lake and resort town of Bellagio. The iconic backdrop serves as the perfect vista to accompany morning coffees and sunset aperitifs, as well as chilled-out BBQs and romantic alfresco dinner parties. 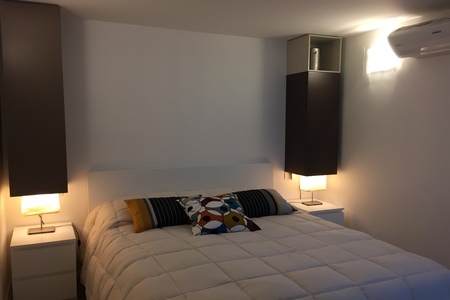 For added convenience the modern holiday duplex also offers private laundry and ironing facilities, as well as a free parking space and a garage for guests’ use. 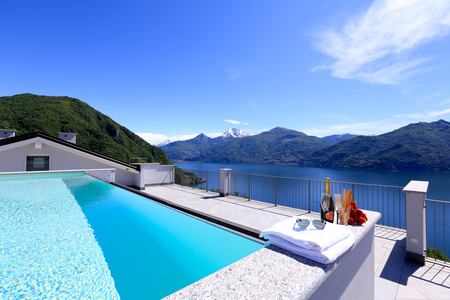 The residence benefits from a beautiful outdoor swimming pool (shared by just 10 apartments in total). 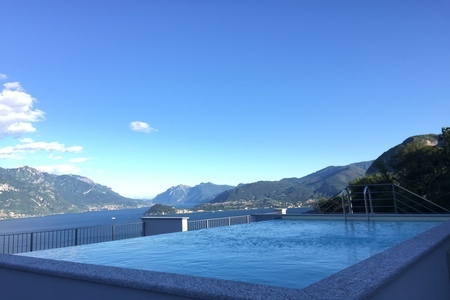 Situated to the sunny Menaggio hillside in Plesio, couples and groups are within easy driving distance of the prestigious Menaggio & Cadenabbia Golf Club, the Loveno Tennis Club, the La Barcola Agroturismo, the main road to Lugano city and of course the lakeside centre of Menaggio. Within the picturesque holiday appeal of the well-serviced resort town, guests will find an array of cafes, authentic restaurants, supermarkets and gift shops to complement their stay. A kid’s park, mini golf, power boat rental service, kayak hire and a fantastic family-friendly Lido (which offers discounted entry for guests!) can also be enjoyed. 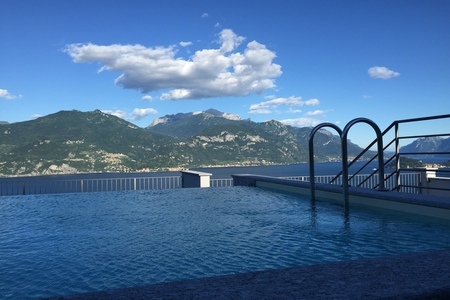 Menaggio is also home to a romantic lakeside promenade, a buzzing cafe-lined piazza and a car and passenger ferry with frequent links to the other famous Central Lake resorts of Bellagio, Varenna and Cadenabbia. 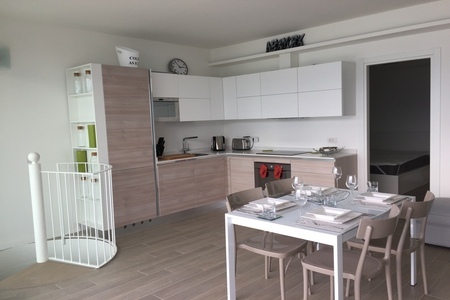 The Central Lake is also home to a wealth of authentic restaurants, family-friendly Lidos, tennis and golf clubs and also opportunities for cookery lessons, wine tasting, sailing lessons, art classes and more! 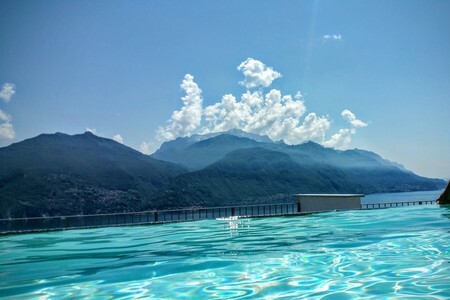 A fast passenger ferry service also operates to Como city, whilst bus links also offer the perfect way to explore the western shore all the way to Como in the south, as well as the north of the lake and Lugano city (via Porlezza). Sightseers can also enjoy exploring the famous villas and botanical garden attractions of the Central Lake; whilst the water sports, hiking trails, extreme sports and close-by Italian Alp ski resorts offer the perfect daytime distraction for active guests and nature fans. The additional service charge is 180. July 2018 Amazing view of the lake, world class. 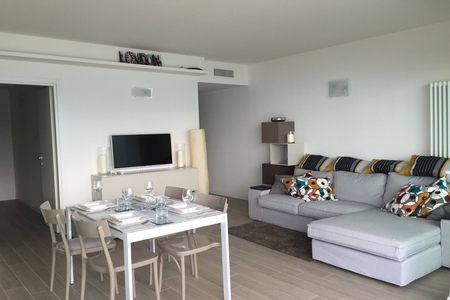 The specific condo (apartment 2) was the best in the complex. Would highly recommend this spot for the view alone. Long walk to town would definitely plan on renting a car if staying here. Adrienne, UK " Adrienne Rose "